While it’s not far from Temple, living in Center City has served as a welcome escape from the daily rigors of law school. I can walk to great cafes and restaurants, hang out in the park, and run along the Schuylkill River Banks. Its location also means commuting to school or to work is easy. Fitler Square is a ten-minute walk from the Broad Street Line and from Center City’s commercial district. Best thing about Fitler Square: Location. It’s got everything you want in an urban environment: parks, cafes, restaurants, and shops. Worst thing about Fitler Square: Parking is a nightmare. How I get to Temple: I either take the Broad Street line or I drive. Both options are very easy (except parking). Closest Grocery Store: South Square Market on 22nd and South Street. On a late Saturday morning, you’ll find me at Café Lutecia. The French café—located on the corner of 23rd and Lombard—epitomizes the neighborhood. The owners, John and Valerie Blum, are on a first name basis with all of their customers. People of all different backgrounds, ages, and interests find their way to the café every weekend. Whether you choose to eat their renowned soups or sandwiches (or both! ), you certainly won’t leave hungry. 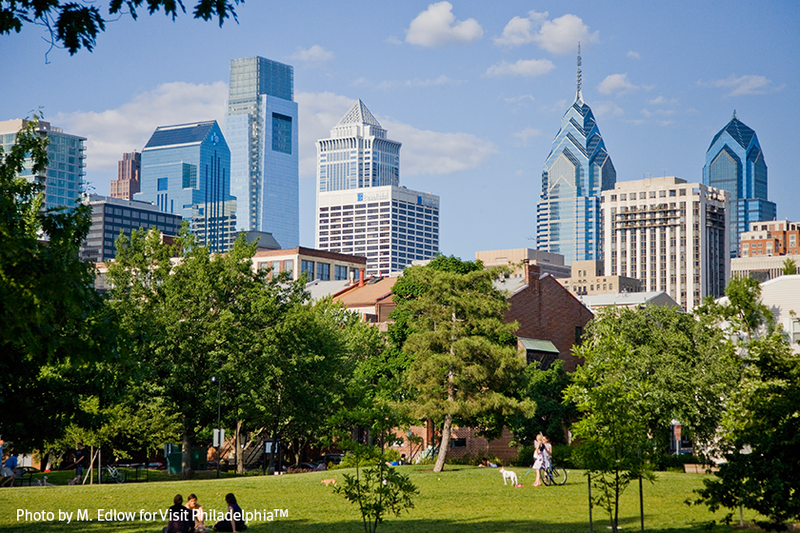 If you’re looking to spend the day outside, you can’t do any better than Taney Park. Taney is located along the Schuylkill River and features basketball and tennis courts, a dog park, ample green space, and great views of the Center City skyline. At night, Pub and Kitchen is the spot. The bar has some of the best beers and cocktails in the city. Whether you’re looking to watch a game, catch up with friends, or go on a date, Pub and Kitchen is one of the best bars in the city. There are two issues with living in Fitler Square. First, the neighborhood is expensive. Rent tends to run north of $1,000 per month for a one-bedroom apartment. Although rent is high, it’s still possible to find an affordable place to in the neighborhood—particularly on Craigslist. The second issue is parking. The neighborhood is highly populated and parking can be a nightmare. There have been a few times where I’ve driven around looking for a space for nearly an hour after I’ve left Temple at night. Despite these issues, I still wouldn’t want to live anywhere else. If you’re looking to live in Center City, are a fan of green space and small restaurants, and can afford to pay a bit more for rent, Fitler Square might be the neighborhood for you. Personally, living in Fitler Square has accommodated all of my needs during law school. If I had to do it over again, I wouldn’t live anywhere else.